In the year 2000, Jennifer Nemec established two companies: Ideation Studio Inc., a design/think-tank-consulting firm; and secondly, Milieu Inc., the brand name under which products are manufactured and launched. Ideation Studio is a multi-disciplinary design firm that offers a broad scope of design services to its clients. Ideation Studio services includes: retail store concept design, brand identity design, and product design; which provides complete cohesive design solutions from concept through documentation and completion. Jennifer’s emphasis on the processes of conceptualization, branding, user experience, research and strategic positioning has enabled the Ideation Studio team to provide its clients with a valuable competitive edge. Jennifer received a Master of Fine Arts in Industrial Design at the University of Illinois at Chicago. Ms. Nemec also enhanced her education with Entrepreneurial Product Design Studies at Harvard University. She has also studied architecture and design in northern Italy. 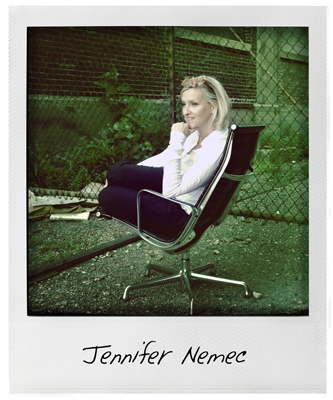 Jennifer Nemec has achieved her goal in becoming a true multi-disciplinary designer. She starting with her undergraduate degree in Interior Design and continued to develop a vast educational background. She has a true passion for design, a strong conviction for hard work, and has emerged as one of Chicago’s premiere visionaries. Jennifer was named a “Woman to Watch” by Today’s Chicago Woman Magazine in 2002. In 2015 Jennifer graduated from the Goldman Sachs 10,000 Small Businesses program where she developed a growth plan for the future and expansion of Ideation Studio. Recently Jennifer was honored as a “Business Disrupter” in Crain’s Magazine. Ideation Studio has become a National Award Winning Design Firm, taking national honors for projects such as Elmhurst Toyota. Jennifer was the recipient of the first place design award from the National Housewares Manufacturers Association National Product Design competition. Her work has been published in various publications such as the Wall Street Journal, a book entitled: America at Home, and VM & SD (Visual Merchandise and Store Design Magazine). Recent Publications include O Magazine in April 2008, Garden Chic in January 2009. Ideation Studio continues to be ranked among the top 40 in the world as a Top Retail Design Firm by VMSD. With nearly thirty years of experience in retail store prototype design, exterior architectural design, graphics, and product design/development, Ms. Nemec has been involved in design projects for many highly regarded companies including: Thorntons, Citgo, Lexus, Acura, Toyota, Sears, McDonalds, Warner Bros., Harpo Studios, The Chicago Lighthouse, Empire Today, and Publix among many others. In additional to her professional work, she has served as an Industrial Design instructor at the University of Illinois at Chicago. Ms. Nemec was instrumental in starting the Chicago Chapter of the Retail Design Institute. Jennifer plays competitive tennis and has studied improv comedy at Chicago’s Second City Theater.